Two top RJD leaders who had voiced discontent over Tejaswi’s name as CM candidate – Raghuvansh Prasad Yadav and Abdul Bari Siddiqui – welcomed Lalu’s continuance as party chief. PATNA: RJD chief Lalu Prasad Yadav on Sunday filed the nomination papers seeking to become the party’s national president for the tenth consecutive term and attacked the Centre over an “emergency-like situation and an economic mess”. Like on all previous occasions, Yadav, 69, was the only RJD leader to go through the formal process for picking the regional party’s head, and it was a foregone conclusion that RJD’ reins would stay firmly in his hands possibly for a few more years. A formal announcement of his name as the 20-year-old party’s national president would be made on November 21, said RJD’s chief returning officer and ex-MP Jagdanand Singh. Given the fresh corruption charges in the Railways’ hotel tender scam that Yadav is facing, his conviction in a fodder scam case in 2013 and the ongoing trial in four other cases against him in the scam, it was widely expected that he may pave the way for his younger son Tejaswi Yadav. But protests against a recent proposal to name the 29-year-old leader the CM candidate for Bihar’s next Assembly polls reportedly forced Lalu to continue as the party chief. “RJD will face the nation’s challenges of rising communalism and bad governance with new vigour. Narendra Modi is running a government of sloganeering. 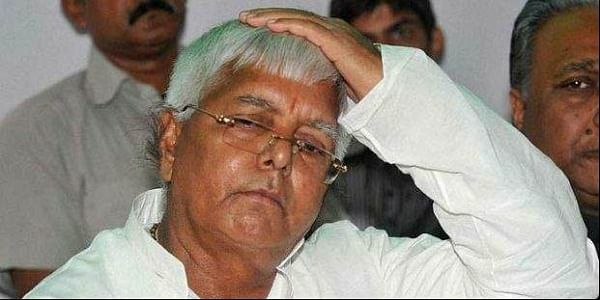 I will unite all like-minded parties to pull them (NDA) down the seat of power,” said Lalu after filing the nomination. Two top RJD leaders who had voiced discontent over Tejaswi’s name as CM candidate – Raghuvansh Prasad Yadav and Abdul Bari Siddiqui – welcomed Lalu’s continuance as party chief. “Lalujee will play a major role in national politics. It is good that he heads the party,” said Siddiqui.